Warblers and Vireos at Morris Arboretum. Sumi Brush Pen and Watercolor Painting by Ken Januski. I ran into a large number of migrating warblers and vireos at Morris Arboretum last Saturday. But I had hardly any satisfying views of any of them. Some, for example a Blackburnian, were just too high in some Tamaracks to see well. Others were down low, right at eye level, but they were so active and there was so much foliage that again it was very difficult to get a good look at any of them. The 12x16 painting above gives some sense of that. 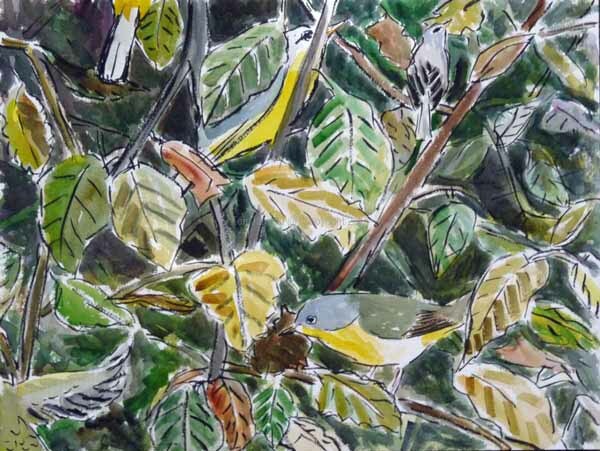 A Nashville Warbler in the lower right corner was the best seen bird, with the possible exception of the Warbling Vireo in the top right corner. The other were just yellow blurs, or a tail with black edging, perhaps fluttering wings. 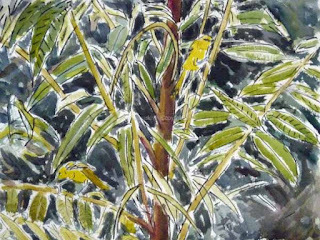 Some of the quick looks were tantalizing, for instance the largish yellow bird at center top, but as soon as they were seen they flew behind other foliage. 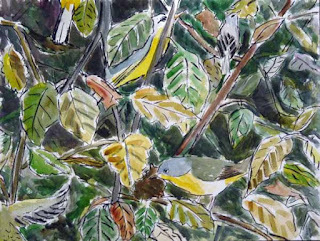 Most likely the yellow bird was a Canada Warbler, especially as we've seen one at Morris two other times during the last week. But I can't say for sure. Because of all of this uncertainty I decided to paint just that: uncertainty. So I'm not trying to portray a recognizable species at center top. Instead it's reminiscent of what I saw. The fluttering wing at lower left and tail at top left don't indicate specific species. They represent instead the real experience that you can easily have at this time of year. Uncertain clues, here and gone before you know it. But that is the thrill of looking for warblers and their sometime companion vireos at this time of year. 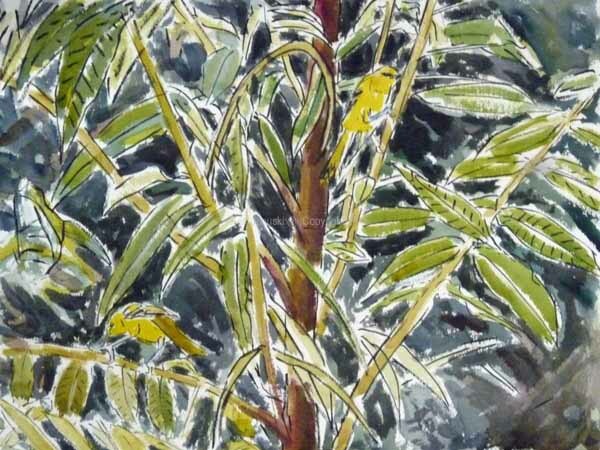 This is another in my series of sumi brush pen and watercolor paintings. All but the Nashville warbler are drawn from memory. I used some of my own photos of Nashville Warblers as a minor reference. But in it also I tried to keep it free as in a drawing from memory. Great Blue Heron in Tree, Red-tailed Hawk and Ruby-throated Hummingbird at Honeysuckle. Sumi Brush Pen Field Sketch by Ken Januski. 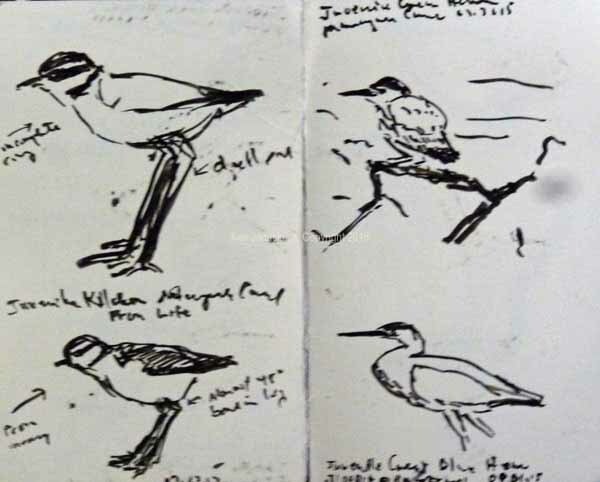 I want to nudge the birdwatcher into a wide-eyed frame of mind, and to be open to ways of watching which will greatly enhance the time they spend looking at birds. It takes a while to unscramble the filters that our brain puts on everything we look at. When we do, we experience moments to savour that carry with them evocations of time and place that can transform our bird watching into poetry. 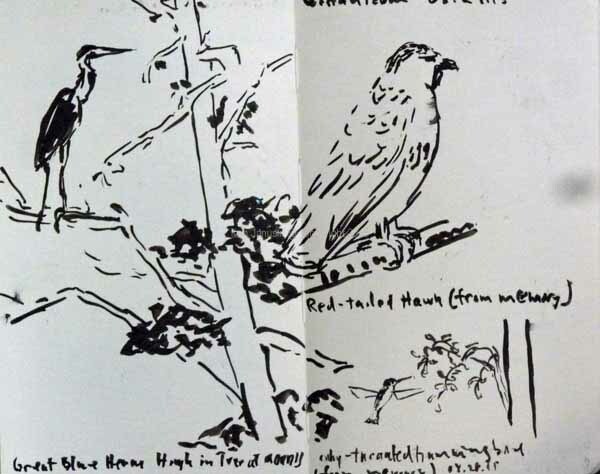 John Busby, LOOKING AT BIRDS: An antidote to Field Guides. I was struck by this quote from the late John Busby as I leafed through the first few pages of his latest book, in particular the part about transforming bird watching into poetry. I guess I would also say it is about transforming sketching into visual poetry. It is much more than just getting the details right. I hate to use the word transform since it seems to be one of the great clichés of the last few years. We have transformative politicians, transformative technology, etc., etc. Only time will tell just how transformative anything really is. Remember the New Economy? But when I read this small section about transforming bird watching into poetry it made perfect sense to me. There is a way of looking at the experience of birding that can be much more than just a tick on a list. Pete Dunne wrote the same thing recently by saying that he was not a lister. And then the bulk of the article was about his own personal list of interesting experiences he's had while birding. His list is called a journal. What I think both Busby and Dunne are getting at is that capturing the actual experience, especially when it is more than just finding a bird you haven't seen before, can be memorable. And your personal connection to it can change it into poetry or its visual equivalent, art. 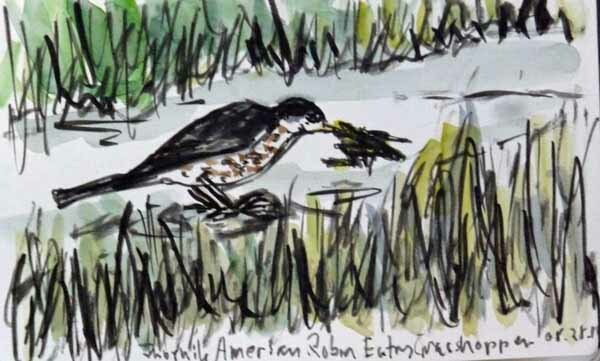 Juvenile American Robin with Grasshopper. Sumi Brush Pen and Watercolor Sketch by Ken Januski. I had also been thinking about this because of my recent field sketches. For some reason I just haven't felt like trying to get down the details, even in the abbreviated manner of 'getting down the details' that I use. Instead I keep going for very quick sumi brush pen sketches. Everything portrayed here was either done in the field or when I got home from my memory of something I'd seen. None of these rely on photos or guide books. AND it shows! No doubt about it. What in the world is in the mouth of the Robin above? This was an interesting experience because I saw something moving low along the ground today along the Manayunk Canal. It was so low and seemed to be moving in such a straight direction that I assumed I'd eventually find a rabbit or some other 4-legged animal. Instead I found a juvenile American Robin, poking at a large grasshopper. I guess he was following him along the ground and thus looked more reminiscent of a rabbit than a bird. In any case I just tried to remember what the grasshopper looked like, not that I really saw it well, and it has turned out as somewhat of a mess. But that's not all that important. What is important is that I've gotten down the experience. It was enjoyable in itself and it also, now that I've visualized it on paper, might prompt me to do a more developed painting or drawing. Though I enjoy more realistic field sketches I find that they rarely lead to other work for me. I'm sure that I incorporate the knowledge gained in some way. But they rarely lead to a painting or print. They are learning experiences, but they are learning about what something looks like and how to represent that on paper. They are not about creating poetry. 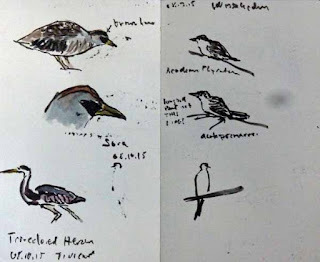 The final sumi brush pen sketches below are a bit more interested in getting down what I saw, for instance the shape of the black facial marking on a Sora. But by using the sumi brush pen I can't be very realistic. This shows up even more I think in the Tri-colored Heron. It is almost nothing. And yet it does, at least for me, capture what I saw. It also has enough freshness to it that it might spark my interest in doing something more developed from it. Sora, Tricolored Heron, Acadian Flycatcher. Sumi Brush Pen and Watercolor Field Sketch by Ken Januski. 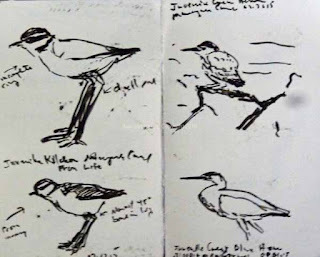 I have conflated two ideas here, John Busby's notion of another more rewarding way of birding, and my own sumi brush pen drawings from life or memory. But I think that they are closely tied together. And I'd encourage any birder to read his last book. It is very simple but also very fresh. Juvenile Baltimore Orioles at Houston Meadows. Sumi Brush Pen and Watercolor by Ken Januski. Last Friday I learned that the work I submitted for Society of Wildlife Artists 52nd Annual Exhibition had passed the first stage. That meant they had to pass the second judging in London to get into the show. That in turn meant a whole lot of logistics: finishing matting and framing, finding supplies with which to ship, contacting an art courier in the UK, etc., etc., and then getting everything off, without breaking the bank, on a very short deadline. That coupled with a vet appointment and then a cat emergency have made the last week or so incredibly hectic. There's been no time for birding, painting, printing or much of anything. But I got the works shipped off on Wednesday and Jerene and I made some progress on the cat emergency later that day. That of course is when the car AC starting overflowing liquid into the front of the car but that emergency was taken care of yesterday. So FINALLY, this morning I birded Houston Meadows. There were three juvenile Baltimore Orioles feeding quite openly in one area, mainly on insects on some saplings. I got a kick out of them, and not finding anything more visually compelling, I decided to do this quick 12x16 painting sumi brush pen and watercolor. I knew that given the scale of the birds that they wouldn't get much attention or detail. But my plan was to make their bright color help them to stand out. This isn't a very developed piece. I probably only spent about 2 hours on it. And I may do a bit more. But basically it's just a quick piece to celebrate my life getting back to normal again. Now let's just hope for success with the SWLA. Due to the extraordinary expenses involved I didn't submit to the show in 2013 and 2014 after having been in the 2011 and 2012 shows(much to my happy surprise). But as time has gone on I've realized that there is only one place that I really want to show: SWLA. It's sad that this is the case. But it certainly is. There is an adventurousness and a familiarity with nature in the SWLA work that makes it extremely appealing. So I've decided that it is worth all the effort and expense. Now it's just a matter of waiting for the results to see if I'll be in this year's 'The Natural Eye' exhibit. Adult and Juvenile Sora at Tinicum. Sumi Brush Pen and Watercolor by Ken Januski. I'm not sure why it is that members of the rail family are among our favorite birds. I'm sure partially it's due to their relative rarity and to their general secrecy. But when you see them you also realize that they have a very subtle beauty to them. Not exactly Scarlet Tanagers or Cape May Warblers but striking all the same. We were at Tinicum (aka John Heinz NWR) the other day looking for some of the collection of unusual birds that have been there recently. 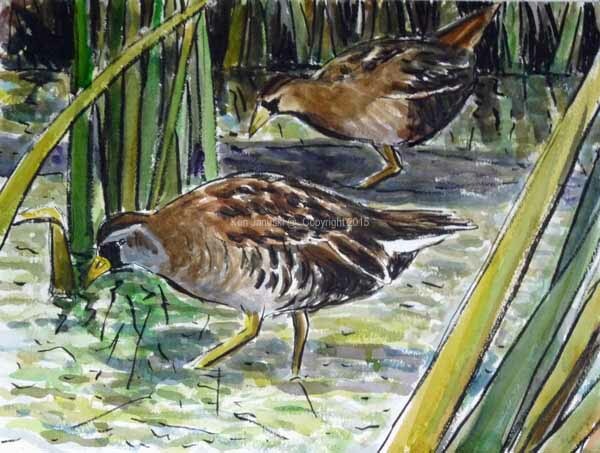 These sora were among them and they were very cooperative in staying out in the open for us to look at them. There was also a third adult that made a brief appearance. 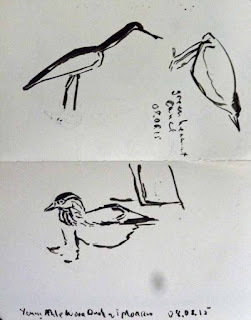 I did a couple mediocre sumi brush pen field sketches of them and of one of the two Tri-colored Heron. I'm not showing them because I pretty much ruined them by trying to add color back in the studio. But I did take a number of photos. Because they were so striking I decided to do another 12x16 sumi and watercolor painting of them. It's based on a number of photos, and my memory of the birds. My favorite watercolor artists generally use it in a much more gentle, fresher and more subtle way than I do. I can greatly admire their work. But when I try to work in that way I'm generally disappointed with the results. But I still want to work in watercolor. The sense of light and freshness that it can have is just too desirable to ignore. So I keep trying. This is the fifth of the larger, for me, 12x16 paintings with watercolor and sumi brush pen. Eventually I'll turn back to printmaking but for now it makes sense to keep pushing on with this combination of media. It feels liberating to be working at a larger scale, though it's nowhere near the 72x96 inch abstract paintings that I used to do. In any case I feel like I might finally be able to get to where watercolor is a comfortable, or at least somewhat comfortable, medium for me if I continue working at this size and with these media. So I will keep at this for awhile. Though I did start reading a new book on Japanese woodblock printmaking, and that is already teasing me with the thought of returning to wood blocks. Flycatchers are among the comparatively small number of birds expert enough to catch dragon flies on the wing, and these insects are too wary to be taken sitting. Arthur Cleveland Bent, Life Histories of North American Flycatchers, Larks, Swallows and Their Allies, p.218, Least Flycatcher entry. Published by Dover Books, 1963. Flycatcher Eating Dragonfly. Photo by Ken Januski. After seeing what I'm just about positive was a very early Least Flycatcher this week I have been reading Arthur Cleveland Bent's book noted above. I was quite surprised, though perhaps I shouldn't have been, to read how unusual it is for birds to be able to catch dragonflies. Along with the Least Flycatcher we saw numerous other flycatchers, mainly Eastern Wood Pewees and Traill's Flycatcher. I say Traill's because I think a couple of birds were Willow Flycatchers. But since they didn't call there is no way to separate the more likely Willow from the nearly identical Alder. 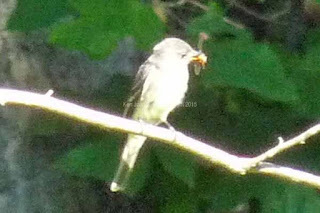 The photo above, from that day is most likely a Eastern Wood Pewee, though the glare and washed out color remove a lot of the field marks that could confirm this. Above is a watercolor sketch I did a few years ago of an Eastern Wood Pewee about to swallow a rather large dragonfly. 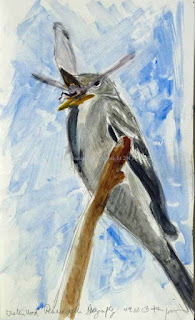 I do love both flycatchers and dragonflies so their combination, though bad luck for the dragonflies, is quite interesting to me. Cherokee Purple, Unger's Cherry, Stupice, Brandywine, Mexico Midget, Tasty Evergreen, Cherokee Purple and Yellow Pear Tomatoes. Photo by Ken Januski. Also interesting and tasty to boot are all of the tomatoes that are now coming ripe in our garden. All of them above are grown from seed from Seed Saver's Exchange though the very small Mexico Midget are volunteers from seeds planted years ago that keep reseeding year after year. I'm not complaining! 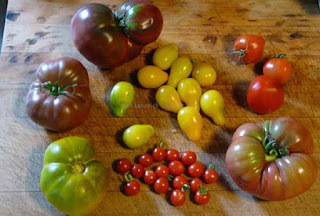 I don't often show much from our garden but I did want to show these beautiful and tasty tomatoes. Killdeer Chick, Young Green Heron and Great Blue Heron. Sumi Brush Pen Field Sketch by Ken Januski. Though I've been out birding a fair amount this week I've done very few sketches. Above are two of the young Killdeer which I said in an earlier post are too bad to show. Oh well. On the facing page a young Green Heron and beneath him a striding Great Blue Heron. 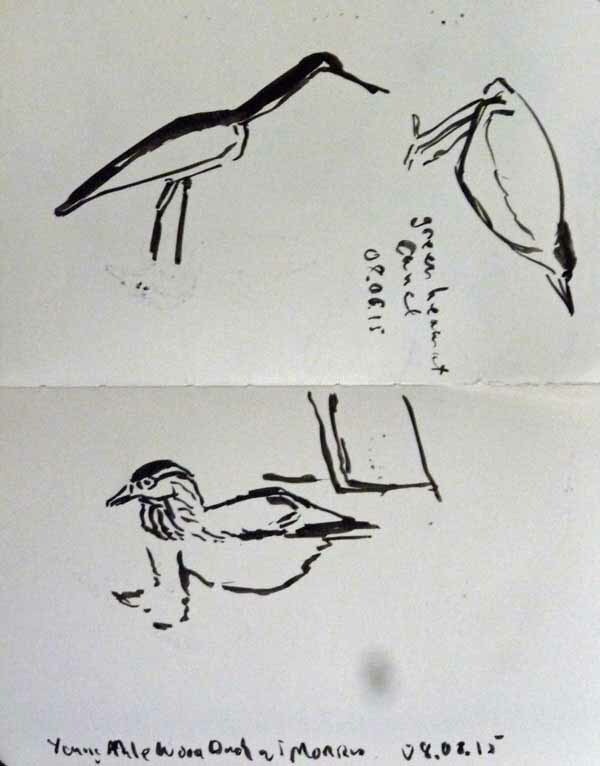 I'm really only showing this to show that I'm still working in the field with the sumi brush pen and because I like the Great Blue Heron sketch. Below a less successful Great Blue Heron, sideways Green Heron and young Wood Duck from Morris Arboretum today. Though there's not much to the Wood Duck sketch I do like it. To a certain extent these sum sketches are accomplishing what I want: they are simple, get a sense of the pose, and might be enough to spur me on to a print or painting. Wood Duck, Great Blue Heron and Green Heron. Sumi Brush Pen Field Sketch by Ken Januski.